The world of James Surls, where thorny vines walk, molecules spin in space, and eyes embellish petals, will be on display at the Southern Utah Museum of Art (SUMA) at Southern Utah University. This exciting exhibition of more than 50 works of sculpture and drawing by the award-winning artist opens to the public on Saturday, July 7, 2018. “I kind of live in a made-up, fabricated dream world,” explained Surls. “And my dream comes true...a lot.” This contemporary artist sees the world differently. Using natural materials, Surls expresses his surroundings through organically shaped sculptures and drawings that capture the atmosphere of the landscape. Visitors to the exhibition will notice that nature figures prominently in Surls’ sculptures and drawings. 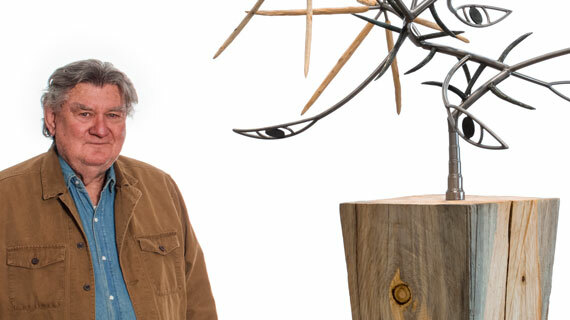 Over the course of four decades, he has developed abstract forms in wood, steel, and bronze that are inspired by flowers, the human body, and rock formations. The exhibition in SUMA will also provide the opportunity to temporarily install a large sculpture on the Sam and Diane Stewart Family Foundation Plaza. Walking through the Thorn Vine, from 2014, is approximately 11 feet wide by 11 feet tall and illustrates a spiral of thorns and a series of eyes that double as petals. Surls has received numerous honors for his work, including the Texas Medal of Arts Awards in the Visual Arts from the Texas Cultural Trust in 2013, and was named Artist of the Year by the American Institute of Architecture – Houston in 2012. His work has been displayed around the country including the Museum of Modern Art (MoMA), the Los Angeles County Museum of Art (LACMA), and the Guggenheim. In addition to major exhibitions throughout the United States, Surls’ large works have been commissioned in Singapore, Houston, New York, and Hollywood. The public opening for the exhibition is being held in conjunction with the museum’s second anniversary. SUMA will also be hosting a Birthday Bash on Saturday, July 7 from 1 p.m. to 4 p.m. Participants can expect many family-friendly activities, such as opportunities to create their own wire sculpture, enjoy live music, and eat birthday cake. More family fun will continue with the Create Playdate program on Tuesday, July 17, at 11 a.m., which will take inspiration from the Surls exhibition with a book called A Line Can Be by Laura Ljungkvist. Following the book, visitors can enjoy a related art activity for toddlers and preschoolers that are accompanied by an adult. This program is free and no registration is required. James Surls: Across the Universe Divide is on display through September 29, 2018. A section of the gallery included in the exhibition allows children and families to further explore Surls’ world through artwork components they can touch and a gallery guide with instructions for an impromptu scavenger hunt through the exhibition. A gallery talk presented by Jessica Farling is scheduled for Thursday, September 6. As part of the SUU Department of Art & Design’s Art Insights lecture series, Surls will give a public talk on Thursday, September 20, in the Great Hall of the Hunter Conference Center. Visit Cedar City’s visual arts destination this summer to see how sculptor James Surls is forging a new way of seeing and experiencing the world around us by expressing his journey through natural materials. More information about the exhibition and programs is available on the museum’s website at www.suu.edu/suma.